An abacus is basically a wooden calculator, but it’s so much more than that. It’s a math developing tool for kids that’s disguised as a toy. The abacus helps with patterns, color recognition, and aids to develop a visual and tactile relationship with numbers. Best of all it’s fun. You get slide & clank beads loudly back and forth while calculating complex algorithms of data. Who wouldn’t want this for their kids and themselves? If you pair an abacus with the song Smarter 123s, your kids will be a counting, calculating, math wiz in no time. Fun fact, “abaci” and “abacuses” are both acceptable plural versions of abacus. I don’t know about you, but I find those plural versions extremely fun to just blurt of nowhere. Try it. Credit to who invented the abacus is under debate. The earliest form of an abacus was used over five thousand years ago and was possibly invented in Greece. However, many scholars have compelling arguments for the Phoenicians, Babylonians and even Chinese. It is interesting to note that it was in use centuries before any modern written numeral system existed. Abacus is a Latin word which was taken from the Greek word abax, which means “board covered with sand.” This was likely a reference to a type of counting board that was the predecessor of the modern abacus and was simply a portable sand table where marks were made in the sand to record totals. The more familiar form of the modern abacus was definitely used in Ancient Rome from 753 B.C.E. to 476 C.E. but because it was made of wood, only a small number of these have ever been found. Those that were found in Rome resembled the Chinese abacus suggesting that the use of the abacus spread from Greece and Rome to China, and then to Japan and Russia. 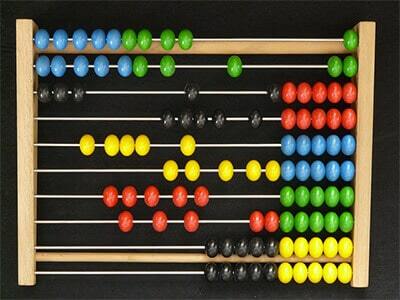 In order to use an abacus, we must first understand how it is constructed and how its parts work to perform counting and mathematical operations. The following descriptions are of the Chinese abacus. The frame is fairly self-explanatory. It is the outside of the abacus and the part that holds the entire apparatus together and in place. (Also called the Crosspiece) The beam runs parallel to the top and bottom of the frame. It runs across the entire frame and divides the upper deck from the lower deck. There are two decks: an upper deck and lower deck. The upper deck is used for keeping track of very large groups of sums and the lower deck is used for individual and smaller sums. Rods run perpendicular to and through the beam. The rods contain beads that are slid towards the beam or away from it. Each rod contains seven beads. Two beads in the upper deck and five beads in the lower deck. The rod to the farthest right of the abacus represents the ones column. The rod to the left of the “ones” column represents “tens” and to the left of that is the “hundreds” rod. This progresses for as many rods as the abacus contains. Beads represent numerical values depending on which rod and deck they are housed in. There may be small dots on the front of the abacus, called House points. Or, there may be off-colored beads. These are markers used to separate numbers into sets of three, just like we use commas. These features can also mark a position if you do not want to start counting from the far right. These features can also be useful for including decimals or fractions for counting or calculations. How To Use Abacus for Kids? After kids grasp the concept of counting to ten on their fingers, they are ready to learn how to use an abacus for counting and to make basic mathematical computations such as addition and subtraction. After your child understands the simple operations, he is ready to learn the more difficult concepts such that you can do with an abacus such as multiplication, division, fractions, and decimals. The easiest abacus to use to teach kids with is the Chinese abacus which has two beads on each rod on the upper deck and five beads on each rod on the lower deck. The modern abacus has one bead on each rod of the top deck and four on the lower rods—if you choose to use this you’ll have adjust your teaching methods accordingly. First, the child must know that the beads on the far right rod on the upper deck represent two hands. Each hand of course, has five fingers. The beads on the same rod on the deck below represent individual fingers on one hand. When all five beads on the lower deck have been slid toward the beam explain to the child that a bead from the top deck will now “hold” those five things place. Then slide the first bead on the upper deck toward the beam and slide all five of the beads on the lower deck away from the beam. Explain that the five lower beads are equal to one upper bead. From here the child needs to understand that the next counting operation on that rod will begin from five. Show the child the five items counted and explain how they are represented by that single top bead. Now count to a sum of ten and slide the second upper deck bead all the way toward the beam and slide the five lower deck beads all the way from the beam. Again show the child how the two beads represent a value of ten and compare them to the ten items you chose to use for comparison. We are now ready to shift are value over to the “tens” rod which is to the left of the rod we have been adding on. We simply slide the first bead on that lower deck rod all the way toward the beam. Now, we reset the “ones” rod and slide those beads all the way from the beam. From here, you should keep explaining the concept of the “ones” place and the “tens” place on the abacus until the child is ready to move on to the “hundreds” and higher rods. After a child understands how an abacus operates and can use it to count they are ready to learn the more advanced functions of the abacus. Addition on the abacus is quite simple. To add the total of 22 and 13 we start with one of those numbers as our input on the abacus. If we start with 22 then we move two beads on the “ones” rod in the lower deck all the way toward the beam. We do the same on the “tens” rod. Now we simply move three more beads in the lower deck to the beam on the “ones” rod which equals five. We now slide down one bead in the upper deck and reset the lower deck beads by sliding them away from the beam. The carrying over function in addition works perfectly on an abacus. Let’s add 18 and 6. We will start by sliding down a bead on the far right rod in the top deck all the way toward the beam. We then slide three beads in the lower deck on the same rod all the way toward the beam. We also slide one bead on the “tens” rod (the next rod to the left) in the lower deck all the way toward the rod. We now add six to our “ones” rod for a total of 14. The “1” in our total belongs on our “tens” rod so we slide a second bead in the lower deck all the way towards the beam. We then reset the bead in the top deck of the “ones” rod by sliding it all the way from the beam. Now we slide one more bead on the “ones” rod in the lower deck all the ways towards the beam. We should now have two beads in the “tens” place and four beads in the “ones” place in the lower deck for a total of 24. Subtraction works in exactly the opposite way by starting with the largest input number and sliding the appropriate beads away from the beam. Multiplication and division can also be performed with an abacus as well as functions involving fractions, decimals and negative numbers. These advanced operations are quite easy on an abacus once the technique for these operations are learned. There is even a binary abacus which is a tool to explain how computers manipulate information. What Type of Abacus Should I Use With My Kid? This article assumes that you are using a Chinese abacus but you may already have or want to use one that is different. Abaci vary in construction and there are many types and styles. The concept and use of each is very easy to grasp once you learn how to use one of any type or style. As an example, the modern abacus only has one bead on each rod in the top deck and only four beads on each rod in the bottom deck. To represent five in the top deck you simply slide the bead halfway towards the rod. Ten is represented by sliding that same bead all the way toward the beam, of course. Again, there is no fifth bead on the bottom deck rods, so obviously you omit the step of counting to five on the bottom deck and just move the upper deck bead so that it is dead in the middle of the top of the frame and the beam. You then slide all four of the lower deck beads away from the beam and start working toward ten. Abaci vary in price but the average cost is about $15.00. Toy departments of most retail stores carry them. They can also be purchased online. As an alternative you might shop for abacus kits. You could even fashion an abacus from most anything. You could purchase small wooden dowels, pipe cleaners and small beads from any craft store and fashion your own. Remember: abacus means “sand table” so its origins are very humble for such a powerful tool. $15.00 is probably a very reasonable price to pay if you consider all the devices in your home that you use to make mathematical computations. An abacus consumes no electricity and doesn’t even need batteries! Abaci have been used for teaching the numeral system and arithmetic in schools for many years and its presence in the classroom clearly demonstrates its importance as a teaching aid. The ideal ages to start teaching a child how to use an abacus is between five to ten years old, but kids as early as two years old have effectively used it. Children are taught to use their fingers when learning to count and because of this, it is difficult for them to comprehend numbers beyond ten (although, in some countries, children also count their toes). 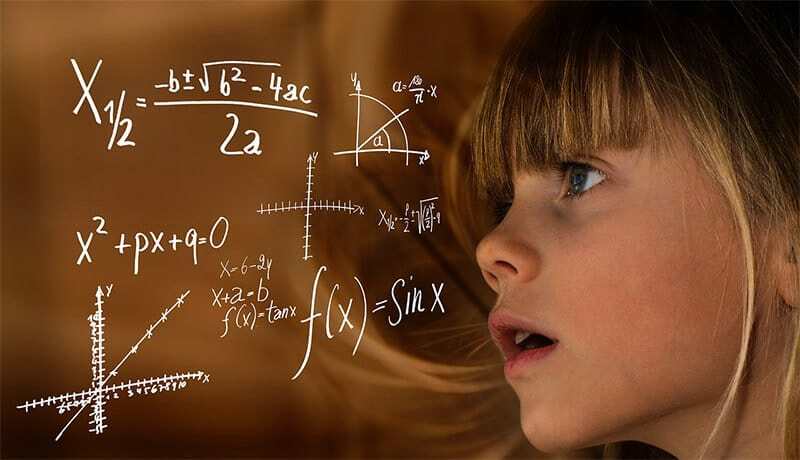 While performing mathematical computations, children do not have an abstract mental process to perform with beyond a ten digit (two hands of fingers) mental image. An abacus replaces the concrete image of hands and provides a concrete multi-digit, bead-based system as a mental image. This image greatly improves the comprehension of mathematics beyond “base ten” thinking. There are so many reasons to use an abacus to teach your child mathematics. Besides the obvious benefits mentioned above, you and your child gain quality time together in a quest to make their education important to them. By introducing the abacus, you create the opportunity to have one on one time with your child and know how their mind is developing. This time also allows you to further educate your child on other subjects such as history, culture, and finances—because, curiosity of the abacus will lead to questions about it. And besides, it’s fun man. Get your kid an abacus.